- Don't settle for just pretty, have everything. Sergio, I already have an iphone camera and so do my relatives, why even hire you? This is question becomes more and more prominent as consumer tech increases. The truth is...no matter how advanced our phone cameras become, what I offer you isn't just about the high resolution images. It is much more. It's the 15 years of diligent practice with using composition, color, and angle in order to create the kinds of images unobtainable by any non professional. Images that make you lose track of time and yourself. Secondly, it's hard to enjoy your wedding day when a small part of you is worrying about having the special moments captured. This is why I make sure to analyze and go over with my clients what moments they specifically want captured so that the work is left to me, and you are left with the ecstasy of getting married. Last but definitely not least, you are left with a set of images that tell a story. I believe a wedding day is much more than just a party day, cake, and fancy dresses. A wedding day is an event where feelings are felt as tears of love hit the floor, connections are made, and where the love journey becomes strengthened. Sergio, can i please take a look a some recent weddings? are any ALBUMS and/or high resolution files included? You get both, always. These albums are the absolute best that I have found, they are made in Portugal by an amazing company. An album is a very secure and safe way of to holding on to your memories and that's why I include an album in every collection. Having the album in your house is a to relive the memories without having to be flipping through a screen. what is one more thing that you would like us to know about you? A few years ago I stopped using sarcasm in all my written communication forms. A little bit later I stopped using it altogether and it has been amazing. I highly recommend it! I am extremely passionate about portraiture (including headshots) because I consider it the most direct expression of the art of photography. I strive to capture what makes you, you. If you are interested, please contact me for more information. Hello, I am Sergio Lopez aka Sergio Photographer at Sergiophotographer.com. Growing up I had zero artistic inclination; I did not sing, draw or play any instruments at all. And the few photos that I took, were so terrible that even my own mom made fun of them. 15 years ago at my brother's wedding in Mexico, I had the opportunity to see their photographer working his face off and having lots of fun. My brother and his wife were so happy that they gave the photographer a big hug at the end of the night. And that really stuck with me. Back then I was using my electrical engineering degree to work at a local laser manufacturing company. As soon as I got back from that wedding, I decided that I wanted to become a photographer, but I realized that most photographers were shooting what it looked like, or supposed to look like, and not what the day felt like; and that is a big difference that I wanted to make with my photos. A lot of weddings appear to be similar from the outside, but they are not. That is why I work from the inside out; I have to feel before I click. I want to be close by and ready when everybody lets go and shows their raw emotions. Over the years I have earned significant photography awards. I have been listed as one of the best wedding photographers in the world by many publications. I get invitations to give conferences and teach workshops all over the world. I also mentor and coach top photographers from around the US and other countries online. What I love the most about my job though, is understanding my clients through photographing them and simply spending time with them. That brings me so much joy. My motto is: I feel before I click. Oh, and my clients give me hugs at every wedding. On the left you can see my two most recent wedding clients Becky and Matt, I love them! On the right you can see my super talented assistant, Diego (my son), holding the off-camera flash, the flower bouquet and instagramming a story for Sergio Photographer. Since 2009 I have been imparting workshops, conferences and one on one sessions all over the world. Teaching is one of my biggest passions, specifically teaching photographers how to capture real life with artistry and passion. I started Sergio School to aid image makers with personalized education and training so they can create photos that are real, powerful and beautiful. Fearless Conference in Puerto Rico November 2018. Photo by Robyn Navarro. 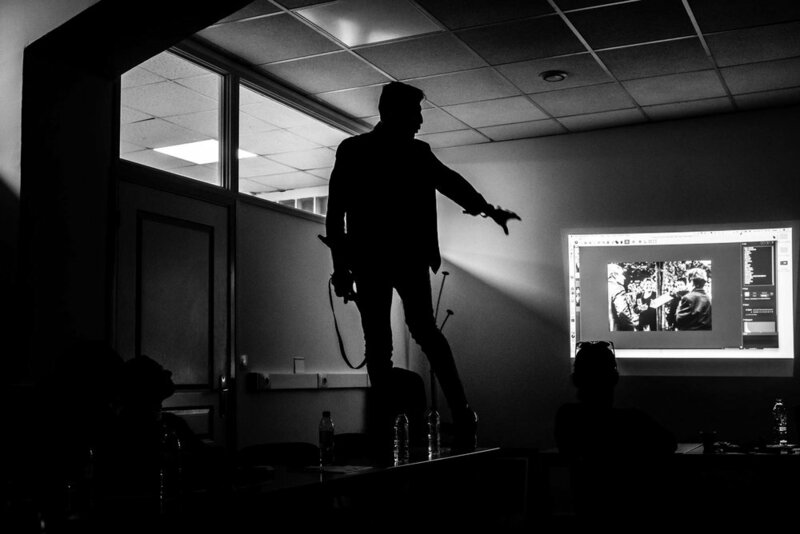 Teaching a wedding photography workshop in Paris. Photo by Chrystel Echavidre.